LONDON (Reuters) - Facebook Inc has hired former British Deputy Prime Minister Nick Clegg to lead its global affairs and communications team, as the social network deals with a number of scandals related to privacy, fake news and election meddling. The appointment makes Clegg, former leader of Britain's Liberal Democrats and deputy to David Cameron in the 2010-2015 coalition government, the most senior European politician ever in a leadership role in Silicon Valley. "Our company is on a critical journey. The challenges we face are serious and clear and now more than ever we need new perspectives to help us though this time of change," Sandberg said on a Facebook post congratulating Clegg. Clegg, whose appeal to younger voters was critically damaged when he broke a promise not to raise student tuition fees, lost his own seat in Britain's parliament in an election last year. He apologized in 2012 for breaking his promise on student charges, saying "I will never again make a pledge unless as a party we are absolutely clear about how we can keep it". Clegg is joining a company that has apologized for its mistakes and has promised to do better on many occasions, for example for breaching its users' trust. 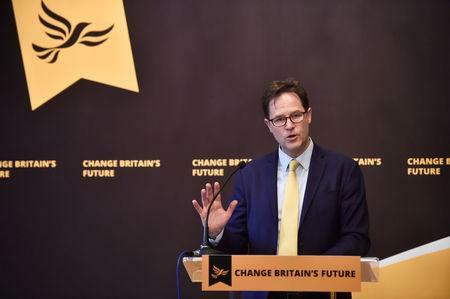 "Throughout my public life I have relished grappling with difficult and controversial issues and seeking to communicate them to others," Clegg said in a Facebook post. "I hope to use some of those skills in my new role"
Clegg, a strong advocate of Britain's membership of the European Union, said it was a "wrench" to be leaving the public debate at a crucial time in Brexit, but added that key decisions would pass to parliament, of which he was no longer a member. Allan, a member of parliament between 1997 and 2005 who now sits in the upper house, is Facebook's vice president of public policy for Europe, Middle East and Africa. "I'm not especially bedazzled by Facebook," he said in an article in the London Evening Standard in 2016. "While I have good friends who work at the company, I actually find the messianic Californian new-worldy-touchy-feely culture of Facebook a little grating." He also said he was not sure that companies such as Facebook really pay all the tax they could, although he added that was as much the fault of governments that still hadn't got their tax act together. Schrage, who led the social network's response to its several scandals, stepped down from the role in June after a decade with the company. Schrage will stay as an adviser, Facebook said.